the kids and I just finished making!! to make this awesomely sweet house ourselves. painting it, and now playing in it. The plain white house, ready for our design talents! I made a couple of executive decisions about the project (as the mom, I can do that). First, I'd help them by doing rough sketches of the design on the house. 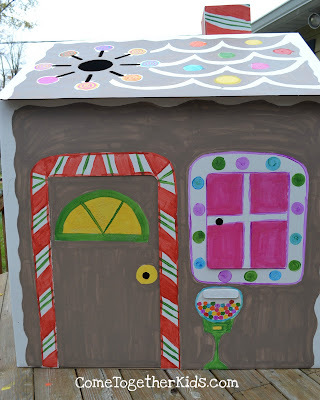 They made all the choices about the candies, colors, etc., but by sketching out the elements for them, the house was a bit more unified and not totally haphazard. Secondly, I decided to use paints instead of crayons or markers. The colors were brighter and we could cover larger areas in a shorter amount of time. You can see my pencil sketch of the roof design. Each kid got a wall of the house to design and paint. 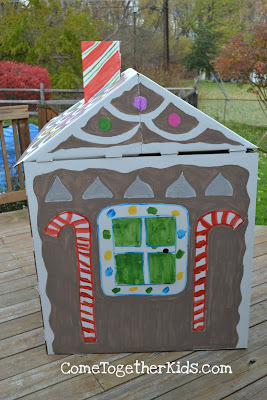 I got to work on the roof and the front of the house (because Mommy likes to do fun painting too! ;) ). I also painted most of the brown while they worked on the fun colors. We really had fun with it and worked on it every chance we had. It took a little less than a week, start to finish, for us to end up with this awesome new kid-sized gingerbread clubhouse! The side designed and painted by my six-year old, complete with gingerbread men and gumdrops! 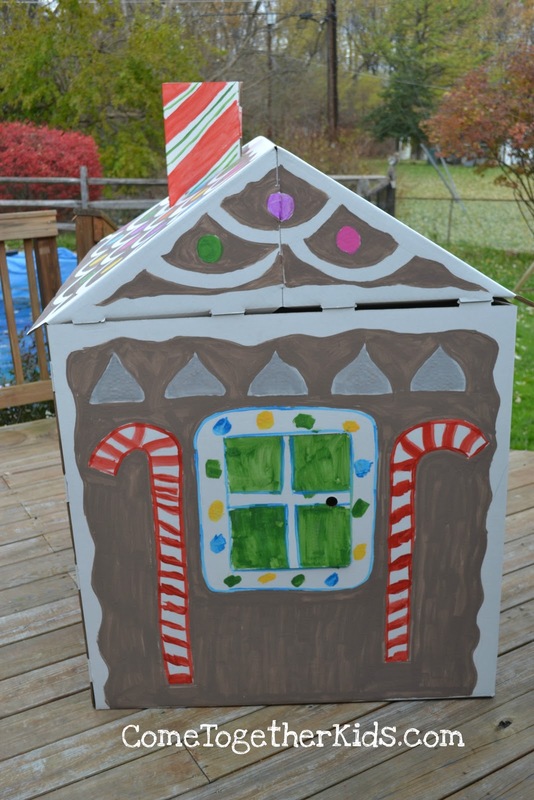 My son designed this side with the candy canes and hershey kisses, but my daughters painted it for him. Note: the roof really does attach all the way, I just didn't do it outside for the picture. 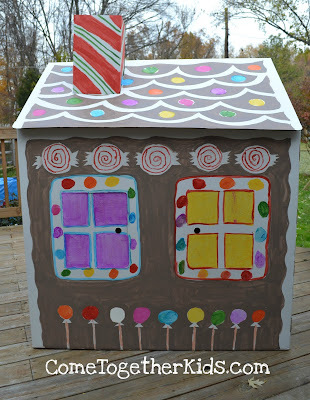 And finally, the back of the house, designed by my oldest daughter, with peppermints and lollipops. The dimensions of the assembled playhouse we used are about 43"x40"x54". Toddlers and preschoolers would be a great size to easily go in and out. My kids have to duck down a bit, but once inside, they have plenty of room to hide out to read a book or play their Nintendos. 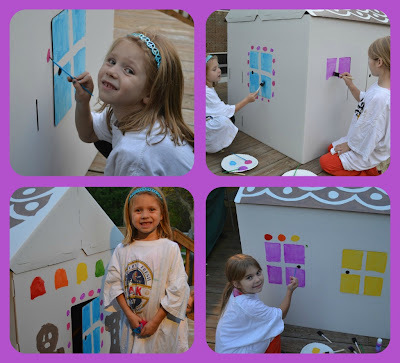 Definitely check out Crafty Kids Playhouses LLC if you'd be interested in making your own house. (They would make an AWESOME gift). I was really pleased with the quality and I LOVED that it was a blank slate. 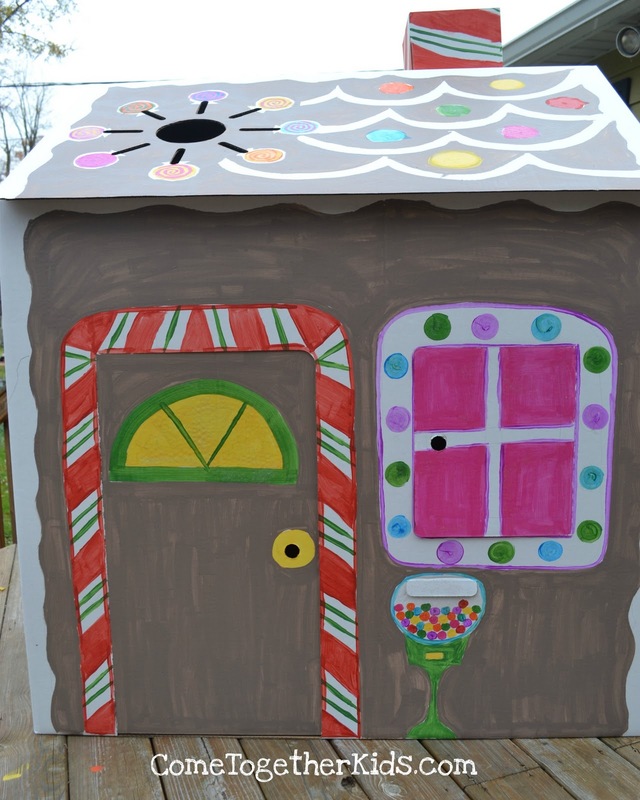 You could make your house look like whatever you'd like and use crayons, markers, paint, etc. to decorate it however you and your kids want. They even have a castle and a rocket ship cardboard house!! 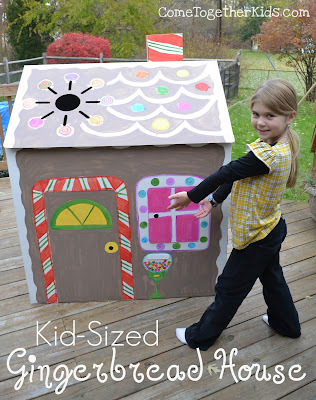 DISCLOSURE: I am part of the Crafty Kids Playhouses LLC affiliate program and I actually received our playhouse for free so I could share our experience with you. However, this post was not influenced in any way by that fact. Without a doubt, we genuinely loved working on our gingerbread house and I wouldn't hesitate to buy more as gifts. This is just beautiful! What a fantastic playhouse! Wow, that is amazing!!! I want one! I love it, my girls would love a project like this. This is adorable!! I love that they did a lot of it themselves! They will have a blast playing in it this holiday season (and beyond I am sure). This came out AMAZING! So magical! Very cute, Laura. You and your kids did a great job!! Wow! 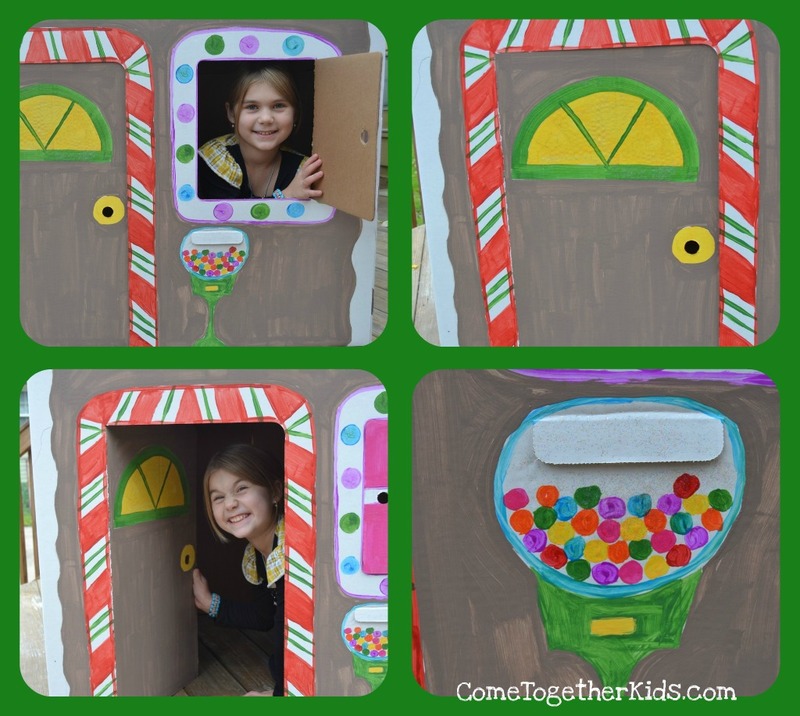 What a fun project and what a fun play thing! How wonderful! The planning ahead of time really paid off! Love the house, the creation, the collaboration! This is so cute I love it!!!! Oh wow, it looks fabulous!! Awesome- that looks like so much fun and your girls did a fabulous job decorating!! Oh my gosh, now I want one! Very well done! This house is awesome! I wonder if it sould be done with normal cardboard boxes.... thinking cap initiated! I love the idea of letting your kids help with the design and painting. How cool is a gingerbread play house! So much fun! Hi! this is totally awesome! I will be adding this to my to-do list. thanks for sharing. new follower. Your kids did an amazing job on the Gingerbread House!! Just posted on Craft Gossip. Thanks for the link suggestion! What a cute idea. My kids would go crazy over being able to paint their own house. Thanks for sharing. I would love it if you could link this up to our linky party going on right now. Love love love this!!!! I am so pinning this and I am adding this to my "to do list." Could you please share this with my readers on my Fun Stuff Fridays link up? I'll be featuring you next week! This is such an adorable idea! My girls would love to do this and possibly would think I was the coolest mom ever! I would love for you to share this at our Home for the Holidays link party! This is so neat! Thanks so much for sharing at my Fabulous Friday link party. What a fantastic idea! Thanks for sharing these fun crafts. I love the theme you choose. The colors look great. Thanks for sharing. Stopping by from the Creative bloggers hop. I want to be a kid again!! 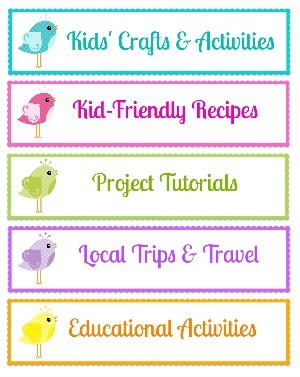 What a wonderful project for you to do with your kids!! 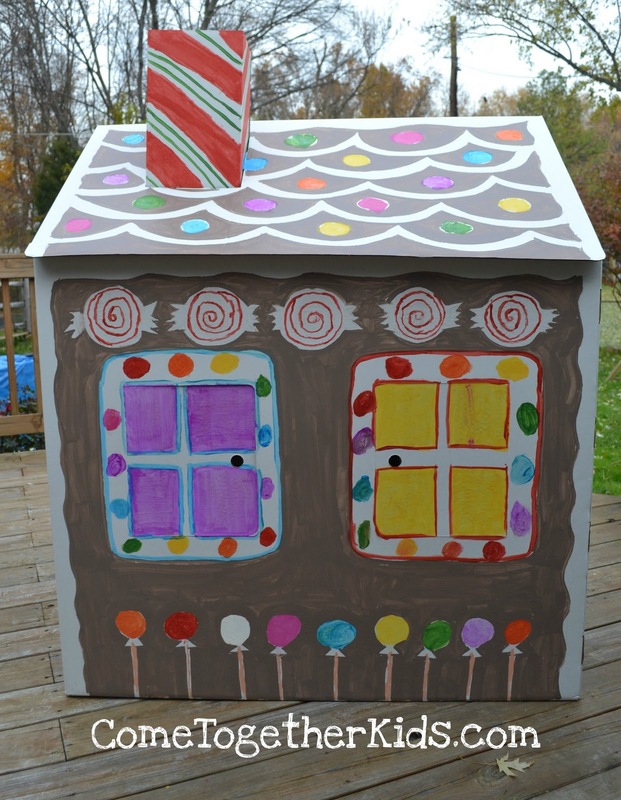 This is so cute and looks like so much fun to decorate! Thanks for sharing. This is being featured this week at Lines Across My Face. This is so fun! I'll bet the kids had a blast! Thanks for sharing! I love your gingerbread house. I can almost smell gingerbread cookies baking in the oven. Such a gorgeous project. I found you on "let the children play." 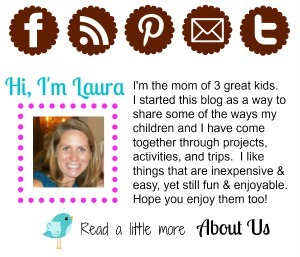 I hope you'll check out my blog: Kindergarten for Teachers and Parents. 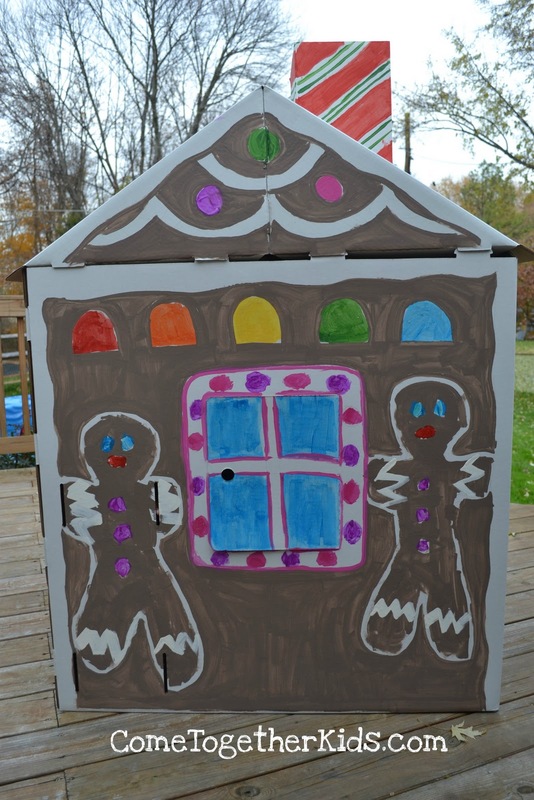 What a fun clubhouse - I love the gingerbread theme you chose and your kids did a great job painting it. Oh my gosh! This is adorable! Thanks for sharing! Now that's just adorable and looks so fun to do! You guys did a great job!